Cyril Simon gathered here some of these documents. The National Library of France has scanned a large number of these. We can only welcome this extraordinary work of safeguarding the ancient manuscripts. They are all downloadable for free. 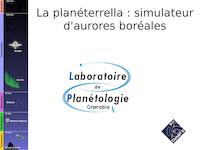 Finally, two presentations of the Planeterrella are presented here. One made for a very wide audience by J. Lilensten. The other made for an audience a little more keen on physics by G. Gronoff. Abstract : We present here a plasma physics experiment which makes it possible to simulate, in a naive yet useful way, the formation of polar lights. It involves shooting electrons at a magnetized sphere placed in a vacuum chamber. This experiment, inspired by K. Birkeland’s Terrella, built at the turn of 19th century, allows the visualization of very many geophysical and astrophysical situations. Although delicate, it is feasible at undergraduate level.